1. Towel-dry your hair after shower. Massage scalp areas affected for 1 to 2 minutes with clean hands. Use of electric massager or therapeutic brush is recommended. 2. Shake bottle and spray Ultimate directly to the scalp making sure that all affected areas are wet, then massage again for two minutes upon application until substance soaks in and deeply penetrates into the scalp. 3. Apply twice a day, morning and evening after shampooing your hair. LEAVE-ON all day and all night. You may use facial cleanser with cotton for cleaning affected areas in case you’re tired to take a shower at night. 4. Spray the tonic immediately or at most within 20 minutes after shower or cleaning affected area. 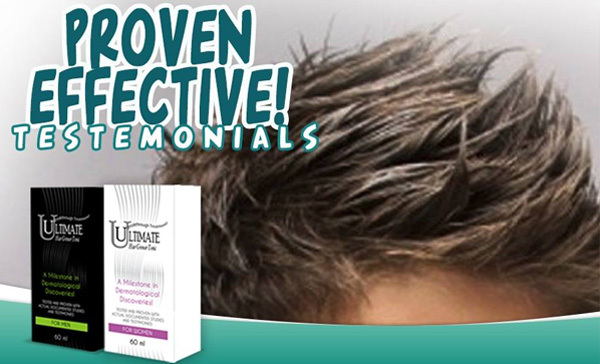 Don’t wait until scalp is totally and completely dry. 5. For persons with Advanced Baldness Condition, maintenance application of four times a week is necessary after treatment period. ULTIMATE basically has no side effects. However, in certain rare cases, skin rashes may develop. If you notice such persisting symptom or burning sensation on your head upon application, call us or check with your doctor before using it again. Persons with hypersensitivity, chest pains, heart problem, hairloss due to illness at childbirth, children under 15 yrs of age, persons with red, inflamed, and infected, irritated or painful scalp should consult a physician first before applying this treatment. 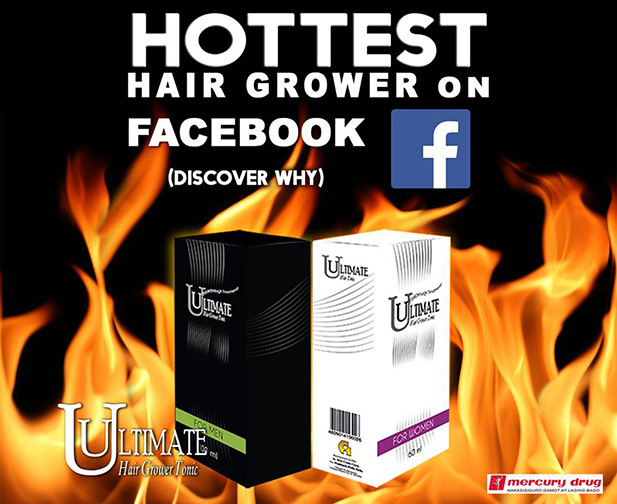 ULTIMATE GUARANTEES that follicles remain organic and alive, open and unclogged. Hair growth requires patience. Losing hair is a degenerating process in your scalp over a period of time. It is therefore logical that reversing the same will take some time as well. Some users saw results faster than others though. 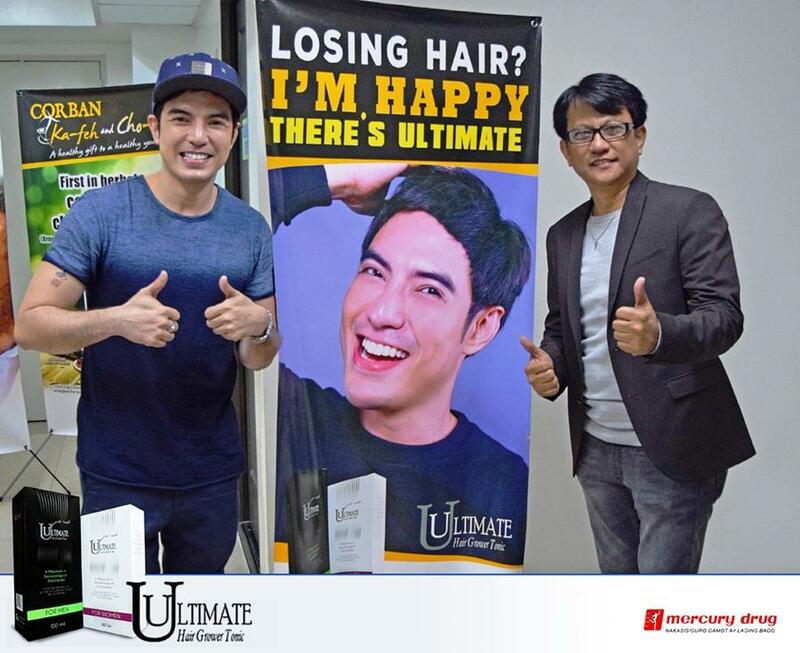 ULTIMATE assures that upon strict and consistent daily application as advised, a significant success results can be highly visible in three to six months. For maximum satisfaction, persevere with ultimate up to eight to twelve months. Love isn’t ownership. LOVE IS PARTNERSHIP. It takes time, effort and pain to be in love. 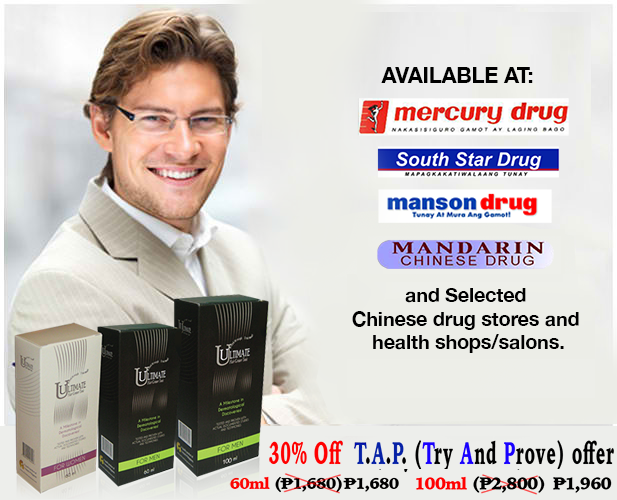 – Ryan T.
Very soon in Mercury and South Star Drug branches nationwide. 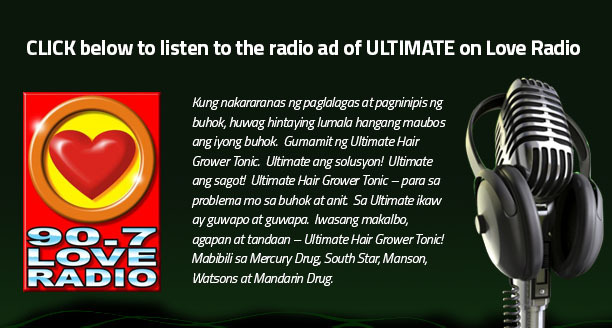 Ultimate Hair Grower Tonic – Proven Effective ! 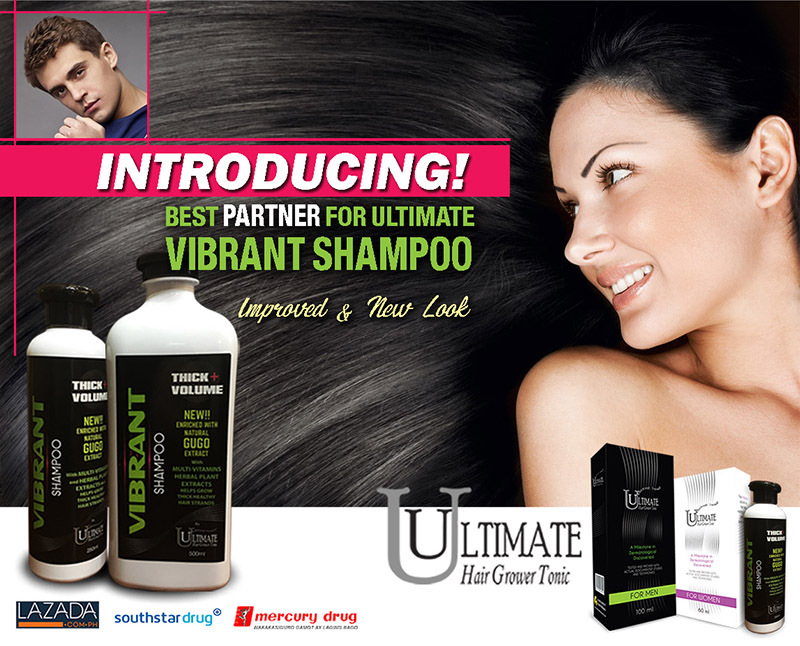 FOR OPTIMUM GUARANTEE, USE VIBRANT SHAMPOO. Shedding in some cases is normal as a result of applying the tonic. Weak hair strands would naturally have to fall soon and as part of Ultimate’s cleansing and preparatory work, it hastens the process causing weak strands to fall prematurely to give way to new hair growth that would bestronger, healthier, longer and darker in color. There is no shedding effect, however, in most scalp conditions. Ang paglaglag ng ilang hibla ng buhok sa ilang kondisyon ng anit ay normal lamang. Ang mahihinang hibla ay talagang patungo sa paglagas at bilang epekto ng pag-gamit ng Ultimate, mas napapadali ang paglaglag ng mga mahihinang hibla upang bigyang daan ang pagtubo ng mga bagong buhok na mas matibay, mas malusog, mas mahaba at mas maitim ang kulay. Datapwa’t wala namang panlalagas na kailangang mangyari sa mas nakakarami at pangkaraniwang kondisyon ng anit. ULTIMATE is not continual. 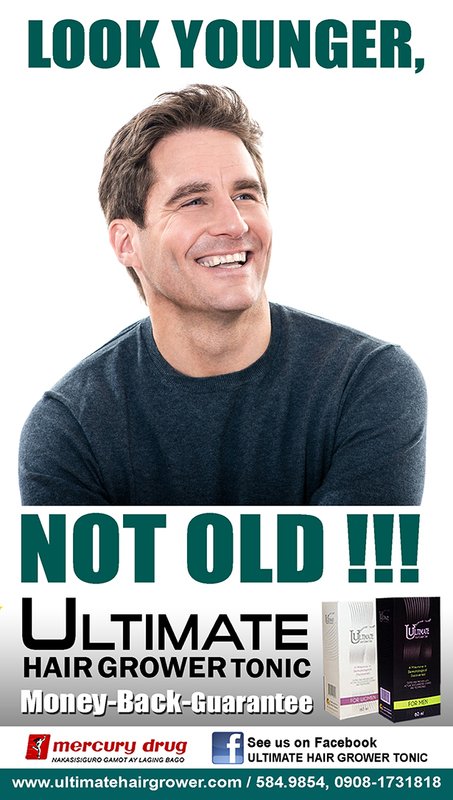 Unlike other hair grower brands that mostly demand continuous “lifetime” treatment, ULTIMATE requires only few months of easy daily regimen. ULTIMATE is not magical. We don’t promise “miracle” in few days for such is non-existent in the actual world of hairloss treatment. Neither do we employ “magic” as part of marketing strategy .